Black Friday marks the unofficial beginning of Christmas shopping season. To take advantage of this, virtually all retailers, big and small, offer various sales and discount. Black Friday & Cyber Monday are the most anticipated days of this season when each & every online seller wants to make most of it. Online stores also start preparing for this time 3 to 4 weeks before. As per Google Trends, searches for the term “Friday deals” is experiencing an enormous spike in the November month. It means people don’t start their seasonal shopping search at the end time. They start searching for the sweet deals at least a week or two weeks earlier. Is your store all set to compete in the race of Black Friday sale? If not then start preparing your store for this season. Check if your online store has a robust backend to handle a considerable traffic, fortunately, with Shopify, this shouldn’t be a concern. Also, check your inventory. Do you have enough stock to cater the needs of consumers? You should also check your shipping capability. Your store should be prepared to ship many orders at a time. Work on your customer services to provide instant support to the consumers. What are you going to offer your customers? You can not impress your customers only with the discounted prices as there would be plenty of same deals across other online stores on that day. So, you need to offer something which can please your customers. Think about the discount rate you are offering. You can provide a significant discount on some specific categories keeping your margin in consideration. You can encourage your customers to purchase two deals to get more discount. For your loyal customers, try free shipping along with discounted prices. Try refer & earn schemes to get more customers. Along with your universal sale, offer unique coupon codes to get more discount on some of your products. Always be in a position to quickly experiment with different ideas to know what works for you. 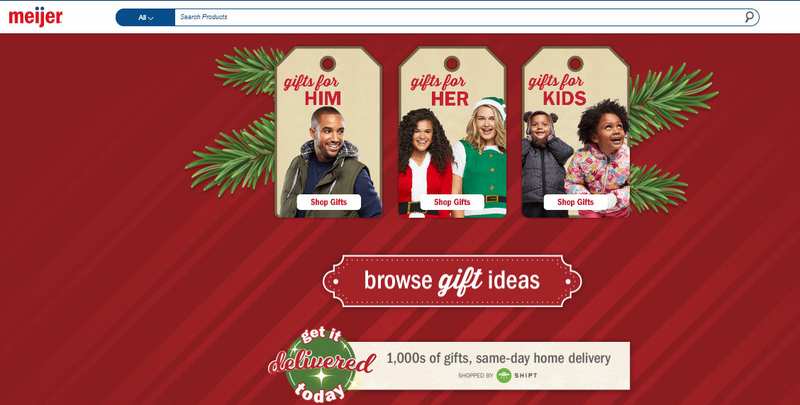 Customize your store appearance and make it look like a holiday theme. You can quickly do that in the Shopify store. Implement some gift theme and create some urgency of purchasing for this holiday sale. Remind your customers that Black Friday & Cyber Monday are approaching. Meijer is a regional American supercenter chain providing Grocery, gift cards, electronics, etc. 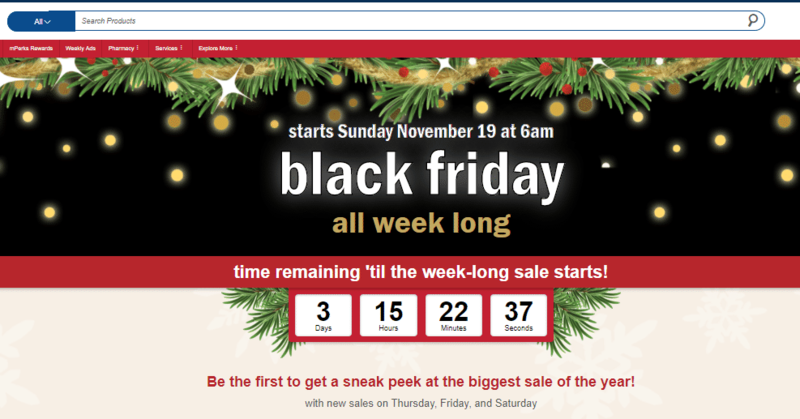 Meijer.com has implemented Black Friday theme on its homepage. Create some urgency by displaying a ticking clock or a countdown on your store page. It can encourage your store visitors to start planning their holiday shopping. Display some Black Friday offers on your homepage. You can categorize your shopping offers and use some creative banners. It will give a sneak peek to your customers. 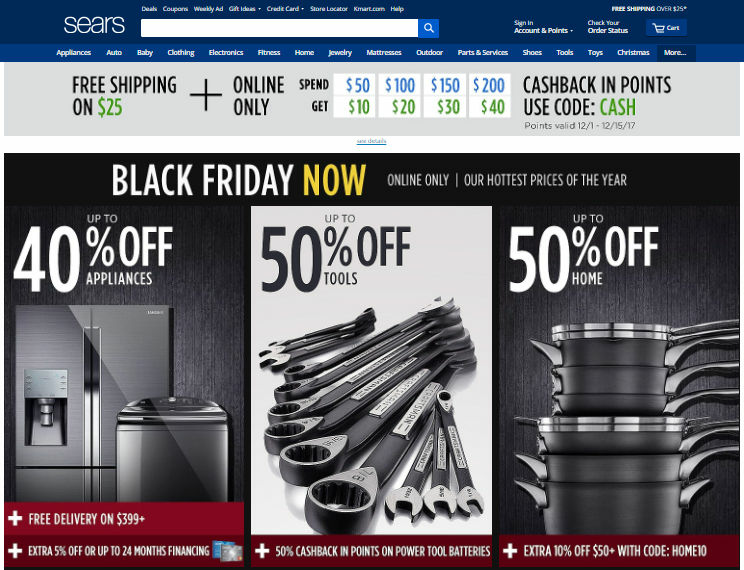 Sears.com, an American chain of department stores displaying the Black Friday offers on its homepage. You can also run Refer & Earn scheme to acquire new customers. Always communicate your terms & conditions else it can cause problems for you and your customers as well. Clarity in terms will also provide transparency & trust to your customers. Define the start and end date or time explicitly. How much discount are you offering? If a particular offer or discount has a condition of minimum cart value, make it explicit. If you have excluded some products from your offer list, then include that list also in your fine print. If your store is providing some special offers which are exclusively for some customers, then you can communicate the same by email marketing. In case of free shipping offer if any country or region is not eligible then mention that also. The motive is not to hide anything from the customers and always maintain the transparency. 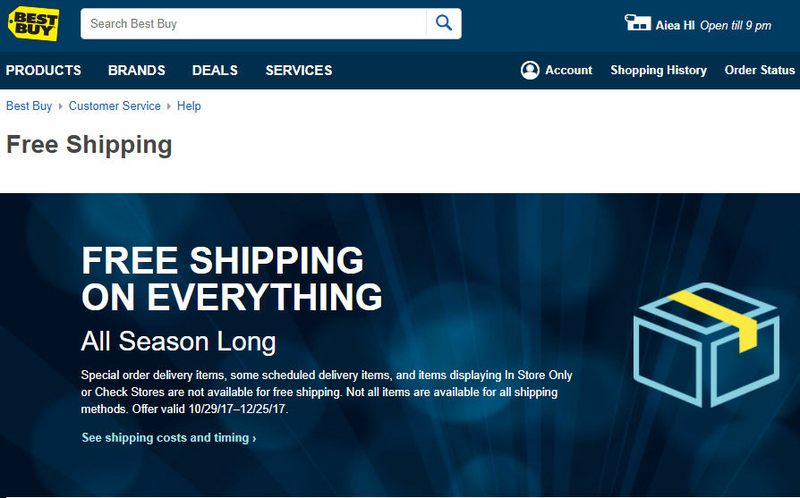 Black Friday Offers on Bestbuy.com. In Free Shipping offer, the exemptions are explicitly mentioned. After analyzing your store and offers, it’s time to show everyone what you have got for them this Black Friday. There are different ways which can be used to market your products, but it’s essential to choose the right marketing strategy. Start marketing your offers at least a week earlier. You can target your existing customers by sending them e-mail notifications about your exclusive deals. Create an attractive template, a catchy subject line & engaging e-mail body text with a call to action button. To acquire new customers, use social media as your marketing platform. Create attractive designs for the Black Friday Cyber Monday deals and share on your social media channels. If you don’t have a designer, don’t worry you can do without one. You can use free images from platforms like Unsplash, Pexels, etc and if you want to create customized designs using some pre-made templates, check out DesignWizard. 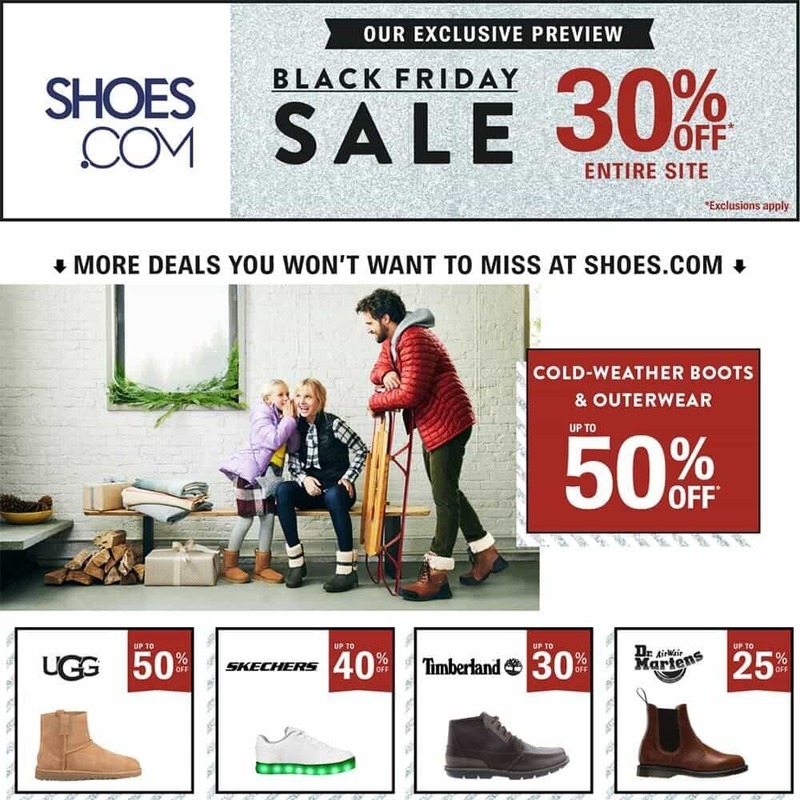 A social Media creative by Shoes.com which is showing its current Black Friday offers. Create content revolving around your Black Friday offers and keep sharing with your customers. You can take some help from Shopify Slogan Generator in creating some amusing content copies. Also, optimize your Shopify Store for SEO to improve your website ranking. If you have also a physical storefront then customize your store as per the holiday season. You can put standees or posters in your stores mentioning the running offers. Set up yourself for all the tracking work after the Black Friday week. Monitor and analyze what worked for you and what didn’t. You can set a UTM parameter to track all your data in Google Analytics. In Google Analytics, you can set up your goals, track your visitors, their engagement and many other metrics. You can also use the Shopify Analytics to monitor the performance of your Shopify store and can check acquisition reports and behavior reports. Tracking and monitoring your Shopify store will prepare you for the next holiday season. You can learn from your mistakes and can apply your learnings next time. The countdown has already begun. It’s time to start preparing your Shopify store for Black Friday & Cyber Monday sale. Black Friday & Cyber Monday is not only an event for the people, but it also sets the beginning of Christmas season. So, a thorough planning and complete preparation are necessary if you want to reap huge profits. Start preparing at least a week or 2 weeks before the main event and optimize your site as per your offers. Deliver an exceptional holiday experience to your website visitors. For more tips, stay tuned to ImageKit.